This chocolate treat is sometimes called a refrigerator cake. Chilling in the fridge rather than baking in the oven is the key to this simple yet spectacular fruity, nutty deliciousness which pleases nearly everyone and is great for entertaining. 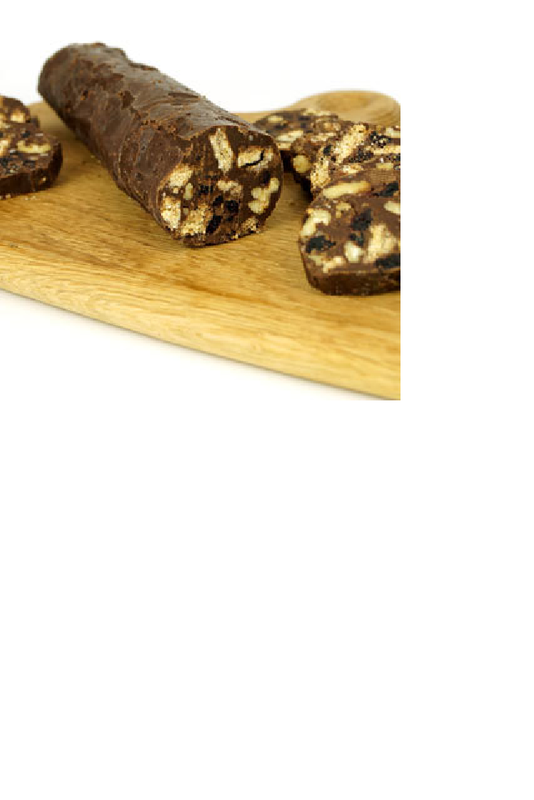 You could vary the biscuits, dried fruit or nuts depending on what you have in the cupboard. Put the walnuts on a baking tray and roast in a hot oven for 3 - 4 minutes, set aside. Break up the biscuits into 10mm pieces and set aside. Gently melt together the butter and chocolate. Add the condensed milk, stirring until combined. Stir in the biscuit pieces, walnuts and blueberries. Form the mixture into a 30cm / 12" sausage shape on the baking parchment. Roll the parchment firmly around the sausage shape, pressing to exclude any air. Chill the mixture for 3 - 4 hours. To serve, unwrap and slice into 10mm / quarter" slices. Store in a tin until required.